Modern Hardware requires strength and functionality whilst enhancing the aesthetics of the door or window in which it operates. Multi point locks, handles & hinges are in constant use having varied demands on them particularly relating to security and/or use by the frail or disabled (including electronic locks & closers). Hardware within Russell Timber Technology’s timber & alu-clad windows and doors are manufactured in Europe of German, Scandinavian and British design, offering quality and performance with sleek good looks and perfect balance. Components from leading manufacturers such as Spilka, Winkhaus, Hoppe are incorporated as are quality weather gaskets and intumescent seals, all vital to a product’s performance. Letter plates, spy holes, door knockers and security chains, vents and extension cills may also be additional requirements, and together with other components must comply with regulations relating to Secured by Design, Life Time Homes and Building Control. 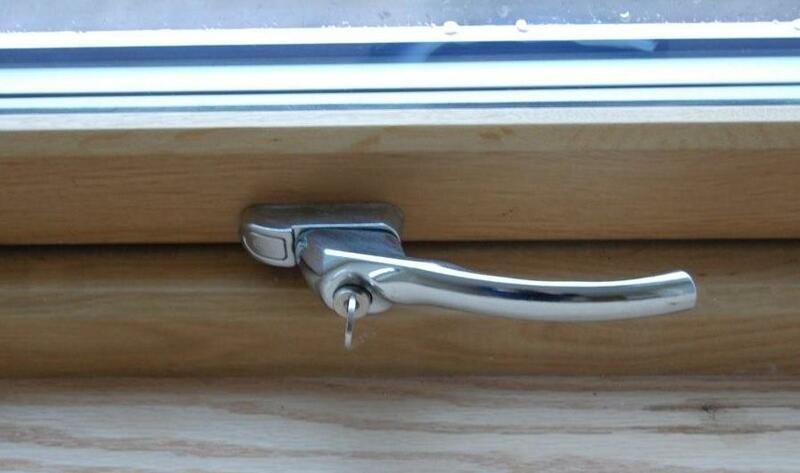 Door hardware is offered in chrome, gold anodised (GAA) and silver anodised (SAA) finishes whilst the norm for windows is white or satin chrome. Hardware carries the manufacturer’s warranty, normally 10 years, assuming no abuse or mis-use.